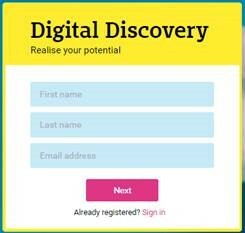 The Digital discovery tool is an online self-assessment tool for staff, which gives them the opportunity to find out more about their own digital capability through a series of reflective questions. 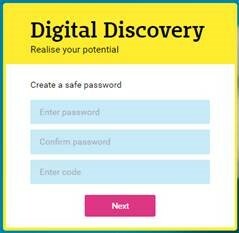 Completing the questions gives them an opportunity to reflect on their confidence and capability in each area of digital capability, and provide feedback including a summary of their digital profile; suggested actions they can take to build their capability further; and links to resources that they can use to support their development. We would like all staff to use this tool, not only because it provides useful suggestions/links for their own development, but also because the summary information provided to the college will enable us to provide appropriate training to target areas in which staff feel less confident. The assessment has 45 questions – 15 sections with 3 questions per section, which should take no more than 15 mins – it’s quick and easy to use. You need to be honest. It assesses your level as developing, capable or proficient, gives you an overview of what you need to do to improve and then resources to use to do this. It then creates a PDF which you can then save to your user area & share. You can also go back in and re-do the test once you’ve done some CPD, if you want to look at improvements. All responses are confidential; the College will only have access to summary data. You must answer every question honestly, however some questions will not necessarily apply to everyone, so for those questions that aren’t within your remit just answer as best you can. E.g. using digital tools in the classroom won’t be appropriate for some support staff. Please complete the questionnaire by 29 March in order for us to determine and arrange the most appropriate training to put on in INSET week. 1. 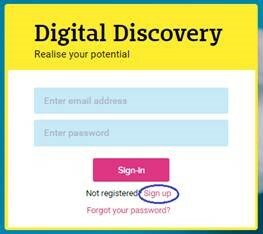 Click on the ‘sign-up’ link just below the ‘Sign in’ box. 3. You will then need to create your password (this needs to be at least 8 characters, one capital letter and one number). This is also where you need to use the code dcap17! 4. 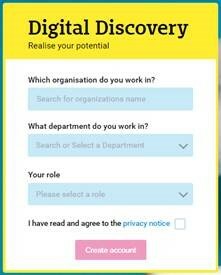 Finally you will need to select your institution from the drop down list (note that this is sensitive to any apostrophes in your organisation name) and your department and role before reading the data privacy notice and creating your account. This entry was posted in HR, Staff Bulletin. Bookmark the permalink.